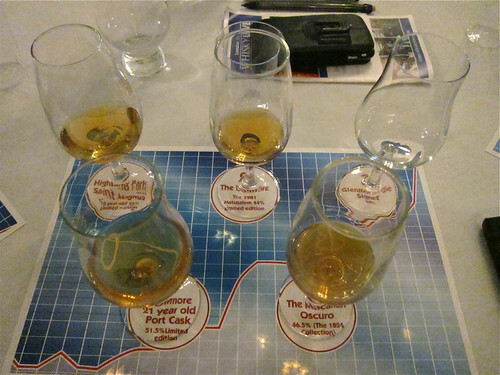 As I don’t think I’ve written about whisky enough recently (sarchasm) I thought I’d put something down on paper/the screen/the interwebnets about Whisky Live London 2011. I’ve been almost entirely fail-y when it has come to writing about whisky shows in the past, mainly as a day of walking around pouring whisky down my neck does lead to incoherence (as my nice performance at the nice Connosr‘s nice WhiskyPod this year demonstrated nicely), but this time I also booked up a ticket to a tasting of The World’s Most Collectible Whiskies with Whisky Magazine’s auction king Jonny McCormick and sitting down helped my pen write slightly more legibly. Yes, the Signet glass is empty. I only noticed after taking the picture and pinched a glass of it from one of the empty spots on my table. There were a surprising number of empty spots. Jonny writes for Whisky Magazine mainly about whisky collecting and auctions, looking after their whisky auction price tracking ‘WM Index’, and brought that expertise to selecting five whiskies that either are already rising in price or could be the auction stars of the future. First on the mat was Highland Park St Magnus, the second entry in their Earl Magnus series of limited bottlings, named for distillery founder Magnus Eunson’s namesake, Earl Magnus of Orkney. The first in the series, the eponymous Earl Magnus, was limited to 6000 bottles, this one to 12000 and the final one, Earl Haakon (named for Magnus’s cousin), to 3000, showing some tricksiness from a company who know that investors like them. The St Magnus comes in at 55% ABV and on the nose had punchy sherry fruit, mulchy peat, almonds and marzipan, and a hint of farmyard mixed in with a meatiness that spread from the nose down to the back of the mouth. To taste there was sweet overripe fruit, sour citrus, sour wood, quite a bit of boozy heat and a lighter flavour than I expected from the quite forthright nose, although mainly the heat of the booze overpowered everything. It could take quite a bit of water, as you’d expect, bringing out spiky wood, sour Fruit Salad chews, spicy lemons and still more boozy heat. I kept dropping in bits of water from time to time as the tasting went on, which eventually tamed it into a flavoursome dram with a buttery mouth feel. The Earl Magnus has already done rather well value-wise, with its release price of £85 leading to a fast sellout and a rapid rise in value to £250-£300 in shops today. The larger release of the St Magnus suggests that it won’t reach the heady heights of the first bottle, but will be a key part of sets of all three bottles in the future, so grabbing one now if you have the Earl Magnus is a no-brainer. You might have to fight for a bottle of the Earl Haakon, but that’s all part of the fun of collecting whisky…I hear. Next we turned to the Dalmore 1981 Matusalem. Matured for 22 years in american oak before being recasked for 6 months to finish in 30 year old Gonzalez Byass Matusalem Oloroso sherry butts, this is part of Dalmore’s increasingly silly range of premium whiskies, although very much at the lower end. It currently seems to be selling at about £400 a bottle in travel retail, a further exclusivity that should help it in the future at auction. On the nose it had oxidised tawny port, dry wood, red grapes and candied lemons. To taste it was quite sweet with sappy wood and twigs – “like licking the inside of a sugar tree” my notes helpfully add – and stone-in stewed fruit (hints of almonds and cherry stone along with the big fruitiness). Water brought out some more sweetness and the wood softened into creamy vanilla, although leaving a bit behind for a long sweetly woody finish. Dalmore seem to be building their range around collectors, with the world’s most expensive whisky (sold in a normal bottle rather than one of a kind Lalique decanter, that is), Trinitas, leading the way with it’s silly £100,000 price tag. Dalmore is currently sitting just outside of the top 10 of the Whisky Magazine index’s auction movers and shakers, but that may well change over the years thanks to their special releases. Third was the Glenmorangie Signet, an interesting dram produced using some chocolate malt (dark roasted rather than actually involving chocolate) based spirit as well as some older whisky from the original Glenmorangie maltings. On the nose it was soft with sweet orange, lime leaves, rich sweet malt and golden syrup. Behind the richness there was a distinctly leafy vegetal note. To taste it had sweet dark chocolate, some gravelly minerality and a leafy nettle finish – “Mossy chocolate paving stones” says my notebook. Water added more sweetness, turning the dark chocolate towards milk chocolate, and added some sweet chocolate malt (hints of milk stout) to the leafy finish. A very interesting flavour which I’m still not sure I’m a massive fan of, but one I will be trying again to make sure. Maybe several times. Along with the interesting liquid in the bottle Glenmorangie, recently a distillery who have been upgrading packaging all over the place, have created a rather fancy bottle, with the glass darkening from bottom to top and having a large silvered cap on top – something that will help the value in future, especially as many people seem to have opened their bottles due to the reports of how good it is. A whisky to buy two bottles of – one to drink and one to hide for a rainy day. Next was the Bowmore 21 year old Port Cask, one of a number of peated port casks that were on show at Whisky Live (despite being recommended it by a number of people I missed out on trying the impressive sounding Benriach Solstice – one for the follow-up list). Another travel retail exclusive, this one is made up of whisky distilled on March 10th 1988 and kept for all of its 21 years in port casks. On the nose it was lightly peaty with big dry red wine, plum jam and glacé cherries. To taste it started with flowery air freshener, moved through a meatily spiced middle with lipsticky wax to a stony peat end. The overpowering air freshener flavour that I got up front pretty much ruined it for me and water didn’t improve it, adding in more waxiness and spicy sweetness but leaving the cloying start. Not one for me, although appreciated around the room. 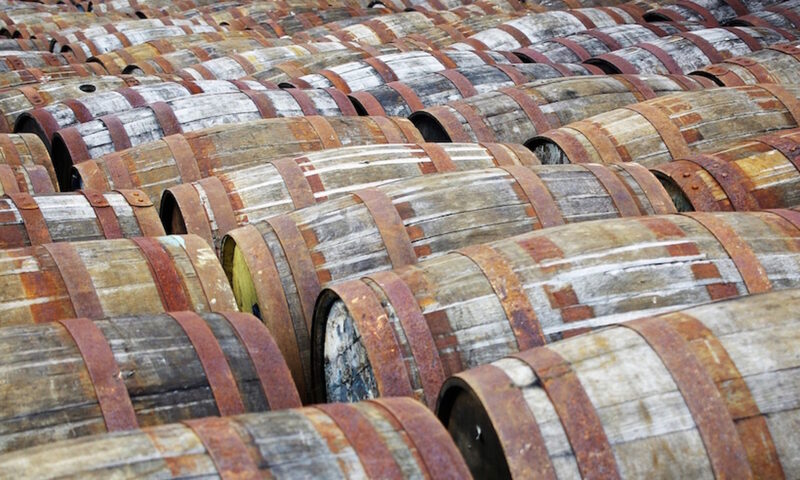 Bowmores are currently riding high in the WM Index, both by sales volume and price per bottle, with old bottlings, such as the Black Bowmores, being spoken of in hushed tones and going for thousands of pounds at auction – their continuing range of premium bottlings will hopefully help them to keep up this momentum. The final whisky of the tasting was Macallan Oscuro, part of their 1824 range of travel retail exclusive whiskies and made up of spirit distilled between 1987 and 1997. On the nose it had raisins, milk chocolate, a touch of struck match, buttered toast, marzipan and shortbread. To taste it was thick and sweet with cinnamon custard and a caramel wood finish. Water brought out more sugar, raisin cordial (not that I’ve tried raisin cordial, but it’s what I imagine non-alcoholic PX to taste like) and butter. My favourite of the night, with my current whisky sweet tooth being firmly satisfied. It’s currently rather pricy, at about £500 a bottle, but Macallans have a lot of success at auction and it might be a nice place to invest, if you don’t drink it. Macallan sits at the top of both Whisky Magazines’s price and volume indices, in part due to the large number of bottlings that their long history has produced, with vintages back to the beginning of the 20th century sitting behind the counter in the distillery shop ready for sale. With an almost constant barrage of interesting bottlings across the price spectrum it looks like they’ll be pretty much permanent fixtures of the auction market. The thing that most surprised me when discussing collecting with Phil Huckle of Pernod Ricard after the The Glenlivet tasting I went to last year was the emphasis on distillery bottlings – in general independents won’t go up in price to anywhere near the extent that original distillery bottlings will. His advice on the night was simple – buy independents to drink, buy distillery to keep. While my lack of cupboard space is currently beating my love of hoarding things, my love of drinking whisky will continue to keep the collecting bug away. For now. I hope. Highland single malt Scotch whisky, 55%. ~£85 from The Whisky Exchange. Speyside single malt Scotch whisky, 44%. ~£400 from World of Whiskies (travel retail exclusive). Highland single malt Scotch whisky, 46%. ~£110 from Master of Malt. Islay single malt vintage Scotch whisky, 51.5%. ~£150 from World of Whiskies (travel retail exclusive). Speyside single malt Scotch whisky, 46.5%. ~£400 from World of Whiskies (travel retail exclusive).